The brown (5%) represents a significant risk of a tornado and I recommend you keep an eye on the weather in that area. 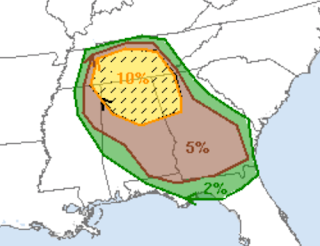 The yellow is double that risk and the hatching is where violent tornadoes may occur. This includes Atlanta, Birmingham, Huntsville and Nashville. In this area it is appropriate to check on infirm friends and relatives and make sure they have a plan to get to shelter quickly should warnings be issued.